So, some time back France Belleville and I started this draw off thingy. 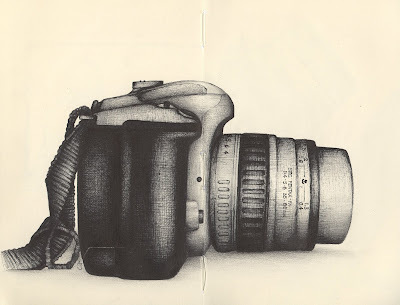 It started with France's great drawing of Tom's camera that you can see HERE. I came back at her with THIS drawing. I wasn't too happy with back then, but it has grown on me a little since. Then, a couple of weeks ago, she threw THIS at me. And finally, here's my response. Drawn in black ink with a little help from a big fat 2B. Yes, it was supposed to be a drawing of the front of the camera. I did try but I got all freaked out by all the circles (I have terrible OCD tendencies when it comes to drawing circles, they have to be perfectly round or I'll have a nervous breakdown). So it ended up being a side on version. I will attempt the full frontal version again sometime in the future. But, one thing is for sure, I definitely won't be getting into any drawing matches with Mademoiselle Belleville* ever again. *Of course, I'm always up for a challenge with Madame Van Stone. Congratulations France and Tom. This was an interesting drawing to do. It stirred up so much stuff, about school and what it was like being that age. I hated school. I know that's a strong emotion but it's how I felt about it. What I didn't know then was that such strong emotions would make good material further down the line. 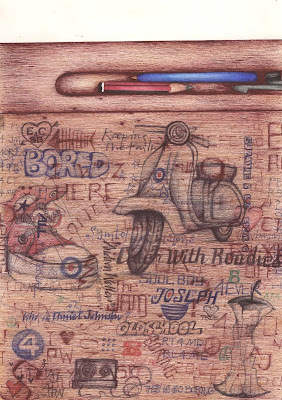 I can't remember doing much graffiti on my desk at school. But that's one of the great things about drawing. Now I can live out all that stuff on paper. My teenage rebel can have the space to run wild (with her pen) and do all those things I was to scared to do. Another thing this drawing brought back was how many crushes I had back in the day. Lots. And lots. Even though they've now all drifted off into my long term memory they, too, make good material. There's one still continues. Decades later and I'm still worshipping at the altar of Paul Weller. 'Exercise Book' print available HERE. Another quickie. It's not great but it's filled my head with ideas and possibilities for future drawings. Sometimes, that's all you can ask of a drawing. 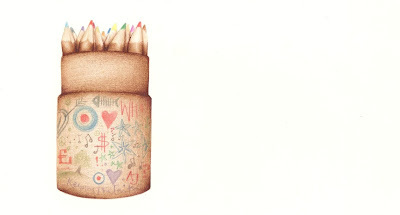 So, here's a little pot, of colour pencils, decorated by moi. That's French, that is. I'd love to say that this was all my own idea, but I can't do that. 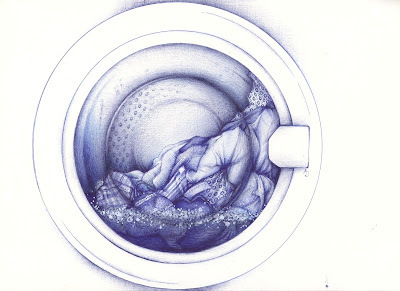 I saw the very excellent Susan Rudat's washing machine drawing and thought 'why oh why wasn't that my idea'. Then I stole it. And, here's a pile of dirty clothes thrown in free of charge. I'm too good to you. 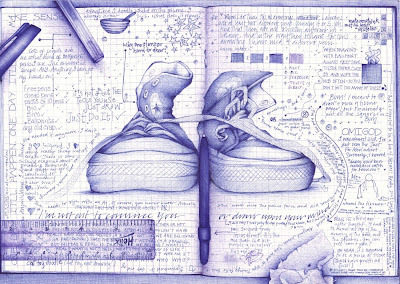 Here's a couple of photos of the contribution I made to Miguel's Moleskine for the MoleyX project. The whole set of photos from that project, so far, can be seen HERE. 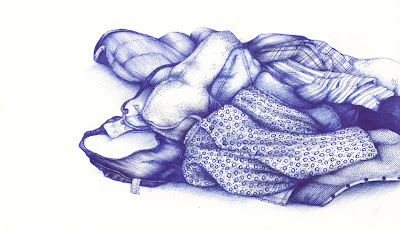 And, I highly recommend a visit to the blog for a little surprise from one of our drawing blog stars. 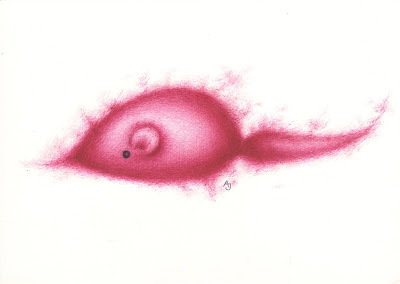 I also made a different version of this drawing in my own sketchbook which you can see HERE. Both of these drawings include three gorgeous buttons sent to me by the lovely Emma-Jane. A kettle, a pencil and a ladybird. Can you spot them? Thanks EJ. A real quickie here, folks. I've been working on lots stuff that I can't post quite yet. So I thought I'd do a quick little drawing. Just something to post. So here it is; a cat toy, before and after it had a make-over by my cat. Poor sod. 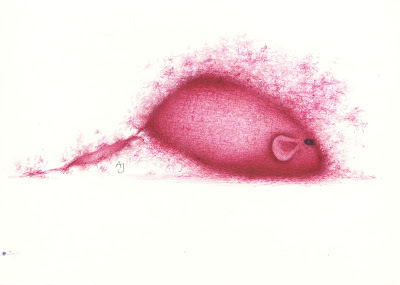 I did these in pink ballpoint which, I'm sure you'll agree, is a truly classy medium. I've had so many enquiries, over the last few weeks, about the type of ballpoint pens I use. The answer is quite simple; any. Any I can get my hands on. I have no loyalty to a specific brand. I buy the cheap and nasty ones. I'll buy them in packs of six or ten. Usually I don't even buy them, I find them. I pick up any lost or discarded pen I come across. I use the ones that come free in charity envelopes. Any. I don't really get hung up on the materials I use. I don't care. I'll use anything in order to draw. And, to me, there is something quite magical about creating a piece of work out of something so cheap. I like that. This drawing is now available as a print HERE.